Finding and fixing the root cause of the moisture is the only real way to stop mold and mildew from growing. This is a guide about dampness and mildew in a closet. I have been away for a week. I came home to find that when I opened my closet, there were little beads of water puddles by the hundreds of the floor. My shoes were not wet. This closet is normally the coldest place in my apartment, even without an air vent. What caused this? What I believe is happening is warm moist air in getting into the closet and coming in contact with the cold walls and other cold areas and forming water droplets. You can see the same effect when you have a glass filled with a liquid and ice cubes on a warm summer day. Water droplets form on the cold exterior of the glass. You could leave the closet door open or maybe turned on light bulb in the closet would have enough heat to warm the air to prevent the condensation from forming. I have a small child in the house, so this is very scary. 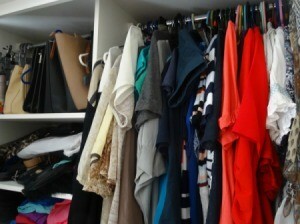 I looked in my closet and I saw that there was mildew everywhere. There is a vent beside the closet that has cold air blowing out of it so I guess the moisture from that caused it, but I'm not sure how to get rid of the mildew for good. I bleached everything, but I'm not sure that is good enough! What should I do? Finding and fixing the root cause of the moisture is the only real way to stop it. Temporarily, you can mix a cleaning solution of one cup of bleach to one gallon of hot water, and wearing gloves, apply the mixture to the closet surface with a sponge, and allow to dry. This should help fade the mildew, although you may have to do it several times. Be sure to keep the solution away from your child, and keep the child away from the midew---it can cause many illnesses and allergies. 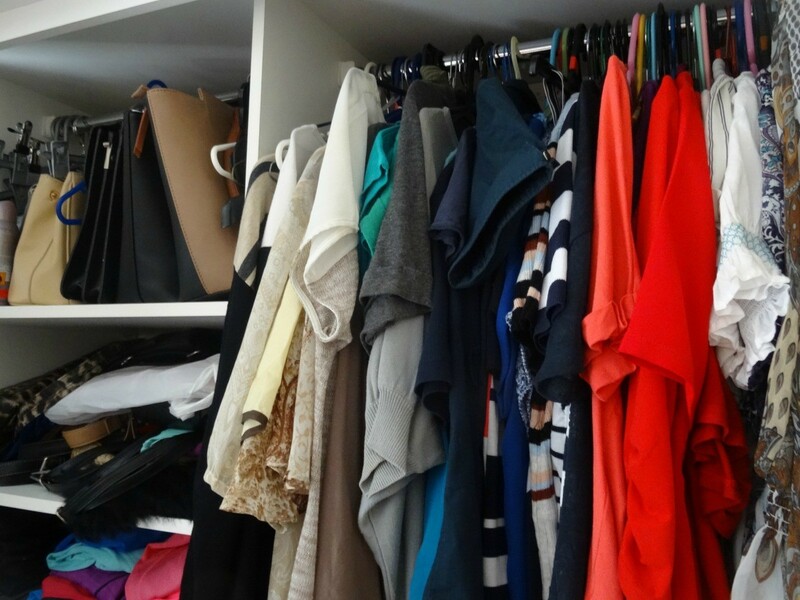 How do I get rid of mildew in closets? I had the same problem years ago. I discovered the moisture was coming from under the house. I didn't have any leaks, just dampness from the dirt. I did two things; 1) insulated the floors under the house, and 2) laid down a vapor barrier (strong thick plastic sheeting). The problem went away almost immediately. This is a project you can do yourself (contractors will charge a fortune). I was in my 40's and single and was able to do it myself with no outside help. The only recommendation I would give you is to wear a bicycle helmet. I can't count the number of times I banged my head on the floor joists! I have found mildew on shoes and a leather jacket in 2 of my closets. Many of our coats smell of mildew, too. These closets both are on the wall running through a bedroom and a bathroom. It was an outside wall, but is now inside an unheated garage. Our house is very humid as well. I hesitate to use a dehumidifier as they use too much electricity. Any suggestions to get rid of the mildew and humidity? Help please. I would start by making sure you have no leaky pipes or roof anywhere. If so, fix them. Then I would get a dehumidifier. While it is running, leave the closet doors open. You may also need to install a exhaust fan in your bathrooms and kitchen as well. Mom has the right idea. However, if you do not have that kind of money, for now, go to an RV shop or storage unit office. They might sell it elsewhere, but I have not seen it anywhere, but these two places. They have something called "DryZair" and it's a crystal type substance that you can put in a hanger designed for a rod, or just in a bowl. When the bowl if wet with no more crystals in it, you have dryer closets and storage units. You have to keep replacing it, but it's cheap. We had this problem, but I found a simple idea you should try. I watched a home repair show that explained that the steam from a shower can travel through the house and will condense in the coldest part of the house, even if the cold part is on the other side of the house. I replaced the switch on our bathroom fan with a timer switch. Now whenever someone takes a shower, they are under strict instructions to set the timer for at least 20 minutes. This has greatly reduced the overall humidity in the house. In our case, the coldest part of the house was the back closet. No steam going through the house equals no dampness for the mildew to grow in. The closet no longer feels damp or smells. Saving those silica packets that come with nearly everything are great to throw back for things like this. Since they do control moisture I always save them for such things, as far as shoes, etc. I place the packet in the box that I will store them in and for the pocketbooks and bags I simply tuck it in the zippered compartment out of site. When I opened my closet today, there is a strong smell of musty mildew. This has not been there before, although two times this winter, the sleeve on my sweater was damp when I took it out of the closet. The sleeve was facing the back of the closet, which is an outside wall. I have lived here two years, and the closet has always smelled fresh. Now today, I cannot stand to open the door! I can find no sign of water leakage in there at all. I don't have money to hire a carpenter, and my husband is disabled. Does anyone have any ideas? What can I do about this smell, that will ruin our clothing?